Below are websites managed by this ministry sharing the truth of God's Word on various subjects. Prophecy for The End Times - A great end times website with eye opening Bible prophecy and end times studies and articles, and an end time news section to keep you up to date with end time prophetic news. Bible Prophecy for Today - Another great end times website with lots of Bible prophecy studies and end times studies. Get a grasp of Bible prophecy symbols with these easy to follow studies and articles. Bible Signs End Times - Showing from the Bible and the world today the signs of the end times. When you look at all the signs in this website, there can be no doubt that we are living in the last days. Ten Commandments of the Bible - A website concentrating on the law of God, the ten commandments. This website shares the much needed truth about the great moral law of God, and dispells the myth that Christ Jesus nailed the ten commandments to the cross. The Bible Sabbath - Sharing the widely rejected and much needed truth about the seventh day Bible sabbath, God's holy day of the 4th Commandment. How to Biblically Worship God - A great website full of encouraging Bible studies to inspire you into true Christian service and worship of God. This is a must visit website for any serious Christian. Hell Truth - A website proclaiming the truth that hell does not literally burn forever, with lots of scripture to back this up. Find out the truth about this greatly misunderstood subject. Speaking in Tongues in the Bible - A website sharing the Bible truth about what it means to speak in tongues, and what it is used for. Is the "gibberish" we hear today true Bible tongues? Find out the truth here. Who is the Bible Antichrist? 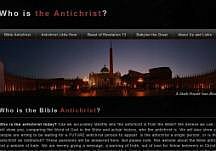 - A website sharing the much needed truth today of who the main end time antichrist is. The world has largely turned away from this truth, but we proclaim the truth no matter what. What is the Seal of God in the Bible - What is the Seal of God and what does it have to do with the Mark of the Beast? Find out the Bible truth here. What is the Mark of the Beast in Revelation - A website that focuses on the true Word of God rather than make mad speculations about what the mark of the beast is. Who Made the Sabbath to Sunday Change?